Ladies and Gentlemen, the moment you’ve all been waiting for: AV has arrived. We’ve been watching the signs all year as one acquisition has been swiftly followed by yet another. 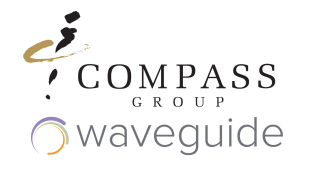 From Samsung and Harman to Diversified and Technical Innovation, most recently of course with AVI-SPL and Anderson AV, and now, Waveguide has been snatched up by Compass Group USA, the world’s sixth largest employer, a global corporation with 2016 revenue over $25 billion. And if that’s not enough to make this by far the most interesting acquisition in this year of endless M&A activity, Compass is a food service and hospitality company. More specifically, Waveguide will operate within Compass’ FLIK Hospitality sector, which has a sizeable AV department, providing AV operations and management to conference centers for years. “They recognize that augmenting those managed services with the front end planning, design, software programming, commissioning, IT, all the things that we do, was a logical fit and made sense to help their current list of customers have a better holistic service provided,” said Scott Walker, president, Waveguide. Waveguide will continue to operate under the Waveguide brand much the same, with day-to-day control maintained by its president, Walker, and its vice president of operations and finance, Andy Beach. The main difference is that they can now enjoy the backing of a very large company to help them grow via capital investments and attracting top talent. Back on a more topical level, this unique pairing points to an interesting narrative about the state of the audiovisual business. “They were looking to really solidify their stake in this service, which I think speaks to some of the trends in the industry and how [AV] has moved from being sort of an afterthought to really mission critical communications,” Walker said. Walker emphasized that Waveguide is by no means in the food service business; on the contrary, FLIK and Compass are moving more formally into the technology consulting and management world. That’s precisely where this story points to a bigger picture of where the AV profession is today and where it’s going tomorrow. “It’s not so much about Waveguide and Compass or FLIK, it’s really about what is happening on planet Earth in 2016 with this little AV thing we’ve been doing for so many years,” Walker surmised. Looking at the avalanche of M&As that has marked 2016, it’s apparent that audiovisual’s enablement of high tech, high impact communications is much more than a luxury for the executive boardroom. “It is really the way global corporations have to function,” Walker said.